As reported in the Softbank Group's online news paper (ITmedia, 2012), the Japanese advertising and public relations company, Dentsu asked 3772 non-Japanese in 16 regions what they thought of the Japanese. The results given above show that words associated with the Japanese are predominantly positive despite the fact, it seems to me, the Japanese pay little attention to public relations. 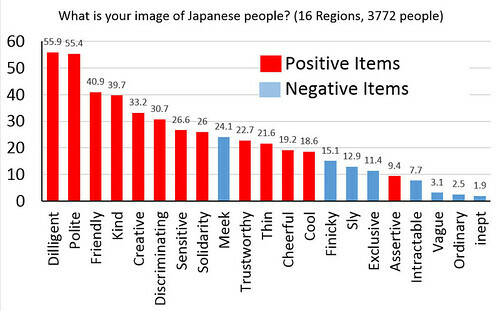 Positive associations, such as "creative" were strongest in South East Asian countries, where, I presume, there is especially high consumption of Japanese produced media, such as popular music and manga. Despite the fact that these positive images I rather fear that the Japanese are going to throw all this love away. I would like to rate "meek" as positive but I have kept to the positive / negative ratings in the original article. Several of the items, such as "kodawari no aru" which I have translated as "discriminating," were rather difficult to translate. "Solidarity" is short for "have a sense or solidarity" which may be coextensive with words with a negative connotation in the West, such as "conformist" or "a herd." I wonder at how the items were selected and fear perhaps they were selected by the Japanese. The Japanese are very interested in what people from other countries think about them since it seems to me, and as argued by Mori (1995), the Japanese lack a linguistic Other and so find it difficult to narrate themselves objectively. The Japanese have instead an autoscopic, mirror-mind, so they know what they look like and that Japan is beautiful. The original Dentsu News Release can be downloaded from the Dentsu website in pdf form here (in Japanese). The translations are mine.